Being part of a team means filling a valuable role. The best teams have people who complement each other and push the group’s performance beyond that of the individual. In a healthcare setting, this concept is especially important. Physicians, nurses, pharmacists, and dietitians each play important roles, but their efficacy increases when they work together. Since Kern instituted nutrition support teams (NSTs) in November 2007, there has been an 85% reduction in ordering errors related to enteral and parenteral nutrition. NSTs take advantage of expertise in various disciplines. A fully staffed NST may consist of dietitians, physicians, nurses, and pharmacists. Some teams also include respiratory therapists and surgeons. Within that framework, dietitians are able to provide greater detail about a patient’s nutritional needs when a doctor sees a patient. They also provide valuable help with following the patient’s progress. “We’re looking for electrolyte imbalances; complications, whether they’re infectious or metabolic complications; adequacy of the support if the patient’s losing weight; if there are changes in their lab values; any medications that may have been ordered that may be incompatible; or perhaps medications that should have been ordered to improve the nutrition support tolerance,” says Phillips. In addition, NSTs allow clinicians to start nutrition support earlier, when necessary, and assess the proper route (the digestive tract or the bloodstream) for feeding, says Jennifer Wooley, MS, RD, CNSD, nutrition services manager at the University of Michigan Hospital in Ann Arbor. The first, most important step for building an NST is getting buy-in from key people. 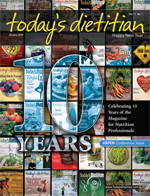 “Dietitians are pro-nutrition support team all the way, but we are one member of the team,” says Wooley. “You need a strong administrator or physician champion to really make this work.” Building relationships with other stakeholders demonstrates broad support for the project and increases its profile. With all of the benefits that NSTs offer, you might expect that they are the standard of care, but that’s not the case. When parenteral nutrition first became popular in the 1970s, there were a lot of errors related to the therapy, Wooley says. Because of this situation, the idea of interdisciplinary teams designed to optimize therapy and improve safety was born. “We have to show that we make a difference, that nutrition support teams, if they can become and stay cost-effective, can realize benefits to patients at minimal costs to the institution,” adds Wooley. Dietitians are working to demonstrate that while NSTs may add costs in terms of staffing, they reduce costs in other ways. “There are some studies on the appropriateness of parenteral nutrition use. When there’s a team involved, usually it helps to prevent inappropriate use of parenteral nutrition, which is a problem in hospitals that don’t have teams,” says Fessler. “Some of the strongest arguments for a nutrition support team are that these highly trained, interdisciplinary members recognize and treat malnutrition early and efficiently, and that translates into reduced morbidity and mortality,” says Wooley. Because reimbursement is such a challenge and each hospital has its own priorities, NSTs come in various shapes and sizes. “On the nutrition support team that I’m on now, we’re all RDs,” says Fessler. “There is also a GI [gastrointestinal] physician whom we work with on our medicine nutrition support team, and there is a surgeon or several surgeons on the surgery nutrition support team at this hospital.” At a hospital where she previously worked, there were also pharmacists and a certified nutrition support nurse on the NST who helped provide comprehensive care. Although pharmacists and nurses aren’t specifically allocated to Fessler’s current team, she still works closely with them. In addition, some hospitals offer services to outpatients to defray costs. “Oftentimes, in order to make the team more solvent, because they get better reimbursement for outpatient care, they offer services to both inpatients and outpatients,” says Wooley. For facilities that would like to start NSTs, there are many ways to educate the participants. “We do journal clubs where we review publications from the various disciplines,” says Phillips. “We do a lot of it from ASPEN [the American Society for Parenteral and Enteral Nutrition] because they are very good at being multidisciplinary already.” The team members also do training within their own disciplines and report back to the group. “We realize that there’s room for improvement, and it really doesn’t begin for most disciplines outside dietetics unless they have a personal interest or they have mentors that, once they get into practice, increase their awareness to the point that they’re seeking information on their own, or they’re working at a hospital where a strong team presence is already there,” says Wooley. Part of the problem, she says, is that nutrition is viewed as an ancillary service. She notes that when those from other disciplines assess a patient, diet is usually fourth on the list of important considerations—airway, breathing, circulation, and then diet.